The Groningen gas field was discovered in 1959 by the Dutch Petroleum Company (Nederlandse Aardolie Maatschappij; NAM) when searching for oil. The production of gas from this field started in 1963. Since its discovery the estimations of its size have been adjusted upwards frequently. In 1959 the size was estimated at about 60 billion m3, in 1962 it was estimated at 470 billion m3 rising to 2000 billion m3 in 1967 to end up at an astonishing estimated total size of 2800 billion m3. The gas quality of the Groningen gas field differs from most other fields in the world. The Groningen gas contains a relatively high part of Nitrogen (14%) and a lower amount of energy per m3 than most other gas. This is why it's called low calorific gas. High calorific gas can be found in the small Dutch gas fields (see picture 1) and also the gas that is imported from Russia and Norway belongs to this class. More than 75% of the gas has already been produced since 1963 and has played a large role in the Dutch economy and welfare since then. Not only around 93% of the Dutch population utilizes this gas for their stoves and boilers, but also large parts of the German, Belgian and Northern-France population. Want to stay up to date about the Dutch gas prices? 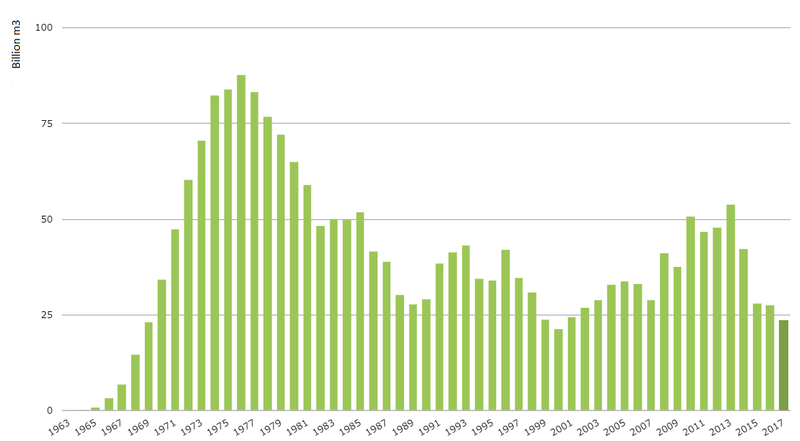 After the start of the gas extraction, the production rose exponentially throughout the 60’s and 70’s. Back then the Dutch government thought that within a (couple of) decade(s) nuclear energy would surpass energy sources like gas. Keeping this in mind they wanted to speed up production to sell a lot of gas to abroad countries. After the oil crisis in 1973 and resistance against nuclear energy the government decided to slow down the Groningen gas production and extract more gas from the smaller fields (“kleine-velden-beleid”). The Groningen field started to function as a balance-field. 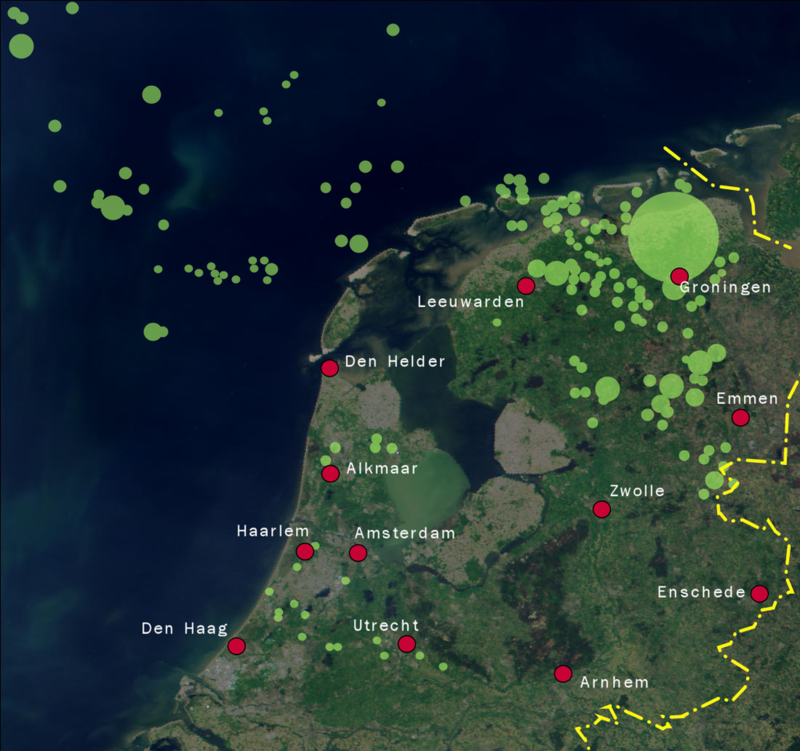 If the need for gas was higher than the small fields could handle, more gas would be produced from the Groningen field. In the period 2000-2013 the production started to rise again due to the ongoing lower contribution of the smaller gas fields. Following a 3,6-magnitude earthquake in Huizinge in 2012, a large increase in research into the gas field was seen. This earthquake also changed the public opinion about the production field. This was the largest magnitude measured in the gas field, however surely not the only one, causing damage to roads, buildings, etc. After this earthquake the gasproduction had already been lowered in a few steps since 2013, following advice of the State Supervision of the Mines (Staatstoezicht op de mijnen; SodM). Towards the ending of 2016 the seismic activity in the “Loppersum” region started to increase, leading to another advice in 2017 of the SodM to lower the production with 10%: from 24 to 21,6 billion m3. On the 8th of January 2018 an earthquake of magnitude 3,4 hit Zeerijp, the largest earthquake since the one in Huizinge. Following this earthquake the SodM advised the Dutch minister of Economic Affairs and Climate to reduce the production to 12 billion m3/year as soon as possible, to reduce seismic activity and secure the safety of the Groningen inhabitants. The measures that will be taken by the Dutch government extend the advice of the SodM. The goal is to reach the level of 12 billion m3/year by October 2022, after which a decrease to 7,5 billion m3/year is foreseen. 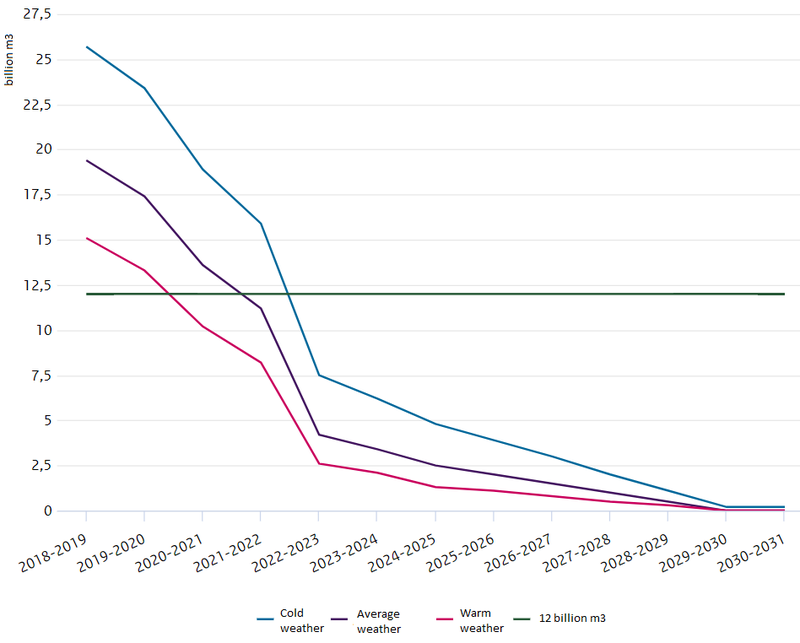 A gradual decrease of the gas production should lead to a complete reduction to 0 by the year 2030 (see picture 3). Picture 3: gas extraction from the Groningen gas field for the future years in 3 weather scenarios (in billion m3). Installing a new nitrogen installation that should be operational by October 2022. This nitrogen installation will convert high calorific gas to low calorific gas and will be operated by the national grid operator. Modification of the national grid. Large consumers should switch to high calorific gas or other “sustainable” energy by 2022. Export of low calorific gas will end after 2030. The low calorific gas imported by Germany, France and Belgium should be reduced by 2 billion cubic meters in the next couple of years. New buildings should be reliant on electricity for heating or other (sustainable) alternatives. Current buildings should be adjusted or converted to gas-free heating in the next couple of years. Horticulture will have to reduce their gas consumption and revert to options as geothermal, residual heat, biomass / green gas or all-electric. Adjustment to the law “never more than enough”. This means that the amount of gas needed to ensure delivery, will be the maximum amount that is produced, even if for a year a higher production was set. As ambitious as the Dutch are, this leaves us with some questions. For example how will the Dutch government secure delivery of gas in the coming years? Probably the dependence from LNG, and Russian and Norwegian gas will increase. Recently a small low calorific gas field was found in the North Sea. Although it is expected to be rather small, it can be exploited with little to no harm for any urban area. How exactly will the large and small consumers depending on natural gas switch to other resources? This is of course very difficult to tell. Large themes in the Dutch climate agreement (“Klimaatakkoord”) includes lots of techniques such as recycling of heat, heat pumps, steam recompression, electrical boilers, electrochemical processes, using hydrogen as source material and solar panels. How will the other countries depending on the Groningen gas reduce their import and how fast will they be able to make this happen? For Belgium, Germany and France the reduction and eventually the end of production of Groningen gas could result in changes of grid fees and an additional cost for building a nitrogen installation. Germany already agreed to reduce the import of Groningen gas by 2020. GTG Nord – a German network operator of the market area of EWE – is making plans to install a nitrogen plant. For Belgium and France there are in the short term less options to reduce the import from Groningen gas. Both Belgium and France are dependent from the Groningen gas import through the connection point in Hilvarenbeek (BE). Belgium aims to change their gas network from low calorific gas to high calorific gas by 2030. There are negotiations between the Dutch government and the French Government and French grid operator (GRT Gaz) to explore the options for reducing import of Groningen gas in France. How will the loss of flexibility after losing the Groningen storage, together with the already closed Rough storage, be compensated? The Netherlands still has more capacity to utilize biomass for the generation of electricity. The “electrification” of energy consumption will also have to get into a rapid. Since the Dutch government wants to decrease overall gas consumption, the contribution of renewables has to increase. At the moment the Netherlands is still lagging when it comes to this. Then let us not forget the most important question: who is going to pay for all of this? Now I hate to be the bearer of bad news, but the most plausible answer will be that grid fees and taxes for everyone in the Netherlands will follow the recent trend in commodity market prices: bullish! Feel free to leave a comment and share our blog posts on social media! E&C is a boutique energy procurement consultancy with an international team of true energy entrepreneurs that offer a unique blend of global capabilities and local expertise. Our offices in Europe and the US serve more than 300 clients from South-Africa to Norway and Peru to Australia that have an annual spend between 1.5 million and 1.5 billion dollar.